We all know that every mobile application development startup faces a lot of inevitable challenges. Right from ideation, creation and funding to the final launch and marketing of the mobile application, the entire process is an overwhelmingly daunting task. 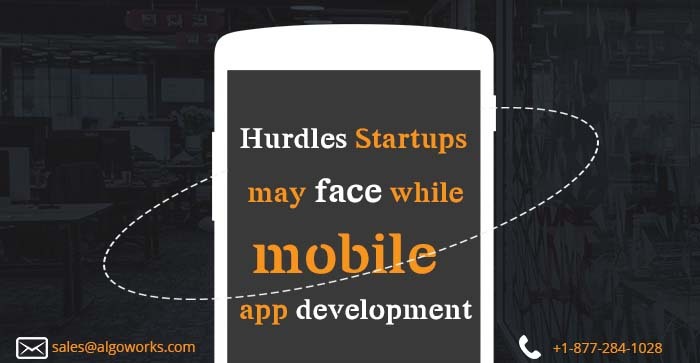 Here the mobile app development company Algoworks has compiled a list of major hurdles that developers may face as startup entrepreneurs. They have also compiled a few tricky potential solutions that can come handy to work in your favor. You may use the solutions without breaking a sweat. The bare fact is that there are millions of mobile apps in the market today. The new apps are mushrooming with each passing day. The biggest challenge for any mobile app startup today is creating an app which stands out of crowd. You might think out of the box and can have a brilliant concept and can create a really good app, but how you will be strategizing the app penetration in order to get the right market for your concept? So, the best way to work on this problem is to align the mobile app development company with the user. Do you need to understand what your customers need? What problem will you be solving for them? Developers have got to reach to the target market in a language that they best understand and therefore they will be ready to face the challenge. Developers dwell in a world where new mobile devices are being invented regularly. Your app will be released on multiple platforms and you might face the challenge of getting your mobile application fit across all the devices. You also have to ensure that your app works on a smartphone as well tablet and phablet. This also states that the mobile app development company or startup has got to pay keen attention to various limitations like operating system requirements, screen resolutions and many other factors. So, if by any chance you are planning on getting your app designed for the latest platform, it would never work as new ones are always coming with different operating systems, different sizes, latest technologies and pixel intensities. For the above-mentioned challenge, the solution is getting a responsive design for your mobile apps. This would work well with different screen sizes and formats. For that matter, we can recall the example of Facebook. Earlier it had many issues but those are resolved now. Just as the world is not small, same is with the field of mobile application development. There are numerous development approaches which are like hybrid app development, cross-platform or native app development or platform specific native app development. Decide the development approach which comprises of deciding framework and mock-ups, strategizing the necessary UI and UX needs and other significant steps. You may make use of platforms like Open Source SDK which offers the ability to develop apps using C/C++ or HTML5. It would allow developers to incorporate single API across various platforms. Once your mobile application development decision gets finalized, to really develop an application it definitely requires ample amount of money. It is not just a one-time investment but the changes and value addition features also require an adequate amount of money. Funding is considered as another major challenge which most startups face. Even if you have a great idea for an application, money problems can force you to nullify your plan. Your mobile app development company must have a funding strategy in place. You may approach friends, family or investors with whom you can discuss dynamics of your app and the benefit they will get if they will partner with you. You can even consider certain online platforms like Kickstarter and Appbackr where you can narrate your app idea and once they are convinced with your application idea, they will start contributing money to your project. Last but not least, as a startup, you must have a precise knowledge of marketing and factual way of promoting an application. The process, of course, involves a lot of PR and media planning. It involves social and viral marketing and internationalization of app. To simplify the app marketing process you have numerous tools like AppTamarin, MobileDevHQ and much more. Competition in the mobile app market is extremely high and tough as there are many other app developers with a big budget and good market experience. As such it is quite tough for you to trademark your application in the market. Supportively, it becomes very easy to get lost in the app market if these mobile apps are not properly marketed. For a really good application, you must have right strategy in hand to penetrate the market effectively. In order to overcome this challenge, your mobile app development startup must have consulted with experienced professionals who have a niche in marketing applications successfully. Put some extra effort, sit with them and formulate an effective application marketing plan. Conclusively, unless these challenges are fully addressed it would affect application’s market popularity. It has been seen that many companies have sunk and stopped suddenly being successful because of their mediocre quality applications and did not have anything new to offer. Of course, the path is definitely not without thorns and often such hurdles surprise you. But by wisely manoeuvring your way past these hurdles you can reach your goals. We understand that as a startup, the mobile app development can be an exhausting task but it is exciting too. Before you actually start the process of development it is always suggested to take a fine look at the market and decide the factors which affect the development process. You must research on apps primarily which are very much similar to that of yours/your ideation. Irrespective of the fact they succeeded or failed, just have a glance, read about them. The blend of right marketing strategy, perfected with a strategized product launch, a reassuring development process to yield an interactive application in an environment of a responsive eam can be the baby steps smartly leading you to the doors of success.